ALLEN PARK — Kerryon Johnson was just a kid when his older siblings hit him with elbows while playing hoops. 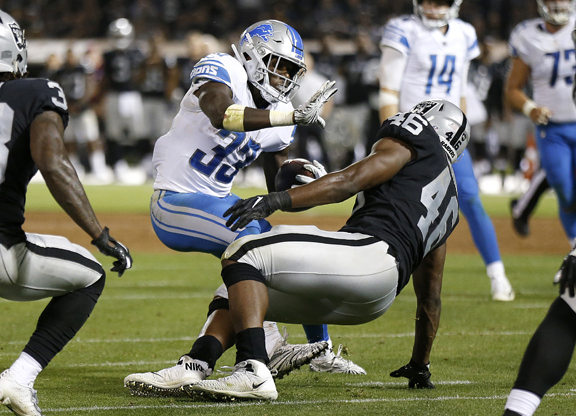 Sure, playing at Auburn and in the SEC did a lot to get the Detroit Lions’ rookie running back ready for the NFL. “I owe my early success to (my teammates),” Johnson said. “They’ve helped me to develop a routine and have encouraged me to stick to it to keep my mind focused on the next day. NOTES: Giants rookie RB Saquon Barkley was held out of practice for a second straight day with a strained left hamstring. … The Lions lined up Graham Glasgow at guard a day after leaving practice with a left leg injury, and rookie Frank Ragnow was moved to center.